It used to be referred to as ʻĀina Momona (the bountiful land,) reflecting the great productivity of the island and its surrounding ocean. In separate volcanic activity about 300,000-years ago, Kalaupapa Peninsula was formed. Penguin Bank, to the west of the island, is believed to be a separate volcano that was once above the water, but submerged within the last 100,000-years. Archaeological evidence suggests that Molokaʻi’s East end was traditionally the home of the majority of early Hawaiians; large clusters of Hawaiians were living along the shore, on the lower slopes and in the larger valleys. Productive, well-kept fishponds were strung along the southern shoreline. The water supply was ample; ʻauwai (irrigation ditches), taro loʻi (ponded terraces) and habitation sites were found in every wet valley. ʻUala (sweet potato) and wauke (paper mulberry) were cultivated in the mauka areas between long shallow stone terraces which swept across the lower kula slopes. The windward valleys developed into areas of intensive irrigated taro cultivation and seasonal migrations took place to stock up on fish and precious salt for the rest of the year. East end’s Pukoʻo had a natural break in the reef, good landing areas for canoes and nearby fishponds built out over the fringe reef. Archaeological evidence suggests it was a heavily populated area; it was also destined to become the first town in the western tradition on the island of Molokaʻi. When the American Protestant missionaries arrived on Molokaʻi in 1832, they settled at nearby Kaluaʻaha. The first church was made of thatch (1833,) a school soon followed. By 1844, a stone church was built. It was not long before a small community was forming around the church buildings. It became the social center of the entire island, with people coming from as far away as the windward valleys, over the pali and by canoe, just to attend church sermons on Sunday and socialize. In the 1850s, Catholic priests began to visit the island; during the 1870s, Father Damien, who had come to Molokaʻi to serve the patients at Kalawao, traveled top-side to gather congregations of Catholics. He built four Catholic churches on the East End of Molokaʻi, at Kamaloʻo, Kaluaʻaha, Halawa and Kumimi. Rudolph Wilhelm became manager of Moloka`i Ranch for Kamehameha V in 1864. 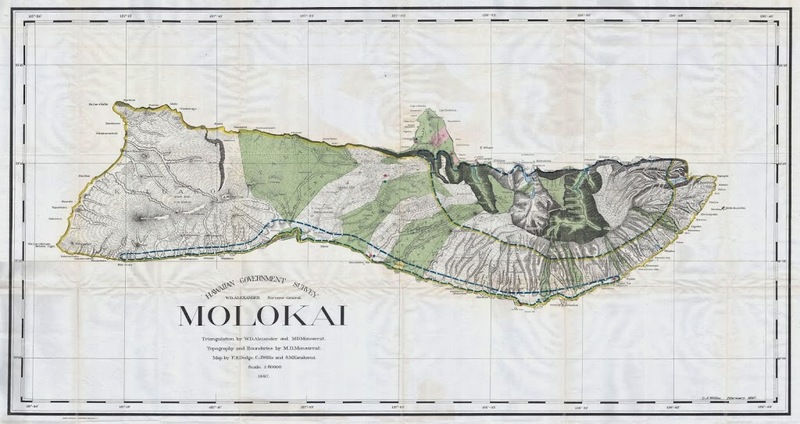 However, Kamehameha V was probably best known on Molokaʻi for the establishment of the Leprosy Settlement on the isolated peninsula of Kalaupapa in 1865. Meyer started to grow sugar shortly thereafter (1876.) By 1882, there were three small sugar plantations on Molokaʻi: Meyer’s at Kalaʻe, one at Kamaloʻo and another at Moanui. Kaunakakai Harbor was an important transportation link and key to these various activities. After 1866, it became vital to bringing in supplies for the Kalaupapa Settlement. Goods, personnel and visitors were landed at Kaunakakai then transported by mule down the pali trail. During the 1880s, sugar and molasses from the Meyer sugar mill were loaded onto carts and taken to the harbor where they were transferred into small boats. These boats came up to the sand beach and take the sugar and molasses to larger ships anchored in the harbor. By 1889 a small wharf had been built at Kaunakakai. After Molokai Ranch was sold to the American Sugar Company in 1897 a new, more substantial stone mole with a wooden landing platform at the makai end, was put up next to the old wharf to service their expected sugar shipments. Finally in 1909, a political division of the island was made incorporating Moloka`i into Maui County and excluding the State Health Department administered area of the Kalaupapa Settlement. This district became known as Kalawao County. During the 1920s Kaunakakai first began to develop as the main business center of the island. Several stores were built along either side of Ala Malama Street indicating the sense of prosperity of the times. This activity continued well into the 1930s, a period that corresponded to the largest increase in population on Molokaʻi. At that time and into the early-1930s, Kaunakakai gradually became the main hub of activity, partially due to its central location and increased population. It was here that a larger, improved wharf had been developed for the pineapple plantations and for the shipment of cattle. Another major change occurred when the Government passed the Hawaiian Homes Act in 1921. Seventy-nine Hawaiian homesteading families moved to Kalamaʻula in 1922 and in 1924 the Hoʻolehua and Palaʻau areas were opened for homesteading on lands previously under lease from the government to the American Sugar Company Limited. The homestead population rose from an estimated 278 in 1924 to 1,400 by 1935. In 1923, Libby, McNeil & Libby began to grow pineapple on land leased from Molokai Ranch; their activities were focused primarily in the Kaluakoʻi section of the island. Lacking facilities and housing, the plantation began building clusters of dwellings (“camps”) around Maunaloa. 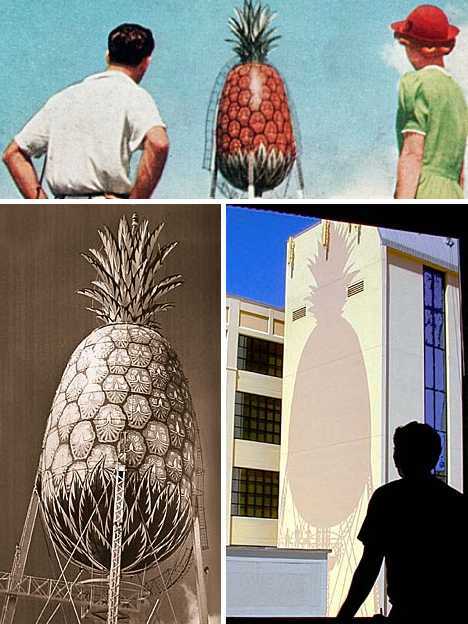 By 1927, it started to grow into a small town – as pineapple production grew, so did the town. In 1927, California Packing Corporation, later known as Del Monte Corporation, leased lands of Naʻiwa and Kahanui owned by Molokaʻi Ranch to establish a pineapple plantation with headquarters in the town of Kualapuʻu. The town takes its name from kaʻuala puʻu, or the sweet potato hill, the hill to the south where sweet potatoes were grown on its slopes. The town was first created when Molokaʻi Ranch (American Sugar Company) moved their ranch headquarters from Kaunakakai to Kualapuʻu after the demise of their sugar enterprise. After the Hoʻolehua homesteads were opened up by Hawaiian Homes Commission in 1924, the ranch headquarters began to take on the character of a real town. However the real change came with the arrival of California Packing Corporation in Kualapuʻu to grow pineapple for shipment to the Oʻahu cannery. In 1968, there were 16,800 acres of pineapple under cultivation on Moloka`i. The Libby plantation was sold to the Dole Pineapple Corporation in 1970, which very soon closed down the plantation when they determined it was no longer a profitable venture. After fifty-five years of operation, Del Monte began a phased shut down operation in 1982 which terminated in 1989. Maunaloa and Kualapuʻu were towns created expressly for agriculture. Kaunakakai came into its own due to its harbor, central location, and the shift of population from the east end of the island. It gradually became the administrative and business center of Moloka`i, much as Pukoʻo had been many years before. Lānaʻi City is the last intact plantation town in the State of Hawai‘i. This unique status is in part a result of its isolation, with Lānaʻi being physically detached from any other town or city in Hawai‘i. A walk through Lānaʻi City is like a walk back through time. A walking tour has been established in the City that helps recall the people, places and stories of this community. Around 1919, Gay experimented with planting pineapple on a small scale. He eventually sold his interest and James Dole’s Hawaiian Pineapple Company, Ltd. purchased the island and began the subsequent establishment of its pineapple plantation. The story of Lānaʻi City begins when James Dole purchased nearly the entire island of Lānaʻi in November 1922, as a part of the holdings of the Hawaiian Pineapple Company, Ltd. Prior to 1922, the lands on which the city would be built had been grazed as part of the old Lānaʻi Ranch operations. Coming from Connecticut, Dole was familiar with the design of the “town square” and grid system of laying out streets in such a way that everything was connected to the “green” or park in the middle of town. Under Dole’s tenure, the Lānaʻi plantation and city grew, and at one time the island supported nearly 20,000-acres of cultivated pineapple, making it the world’s largest plantation. For seventy years, from 1922 to 1992 (when the last harvest took place,) the name “Lānaʻi” was synonymous with pineapple. With the advent of the plantation and establishment of Lānaʻi City, the new Lānaʻi Post Office building (still called Keomoku Post Office at the time, for its original location on the shore), which also served as home to the plantation manager’s office, was opened by November 1924. That original manager and post office building is now the site of the present day Dole Administration Building (fronted by the flagpole). Immediately below was the park, or town square, around which was laid out all of the stores and shops, the bank, theater, Dole’s “clubhouse”, the Buddhist Church and a children’s playground. 22. Pine Isle Market, Ltd. 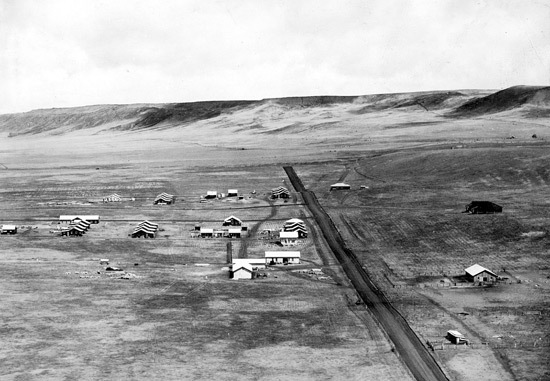 The image shows Lanai City in 1924. Much of the information here is from ‘A Historical Guide to Lānaʻi City (Prepared for the Lānaʻi Culture & Heritage Center.) The Walking Tour map and images of each site are noted in a folder of like name in the Photos section on my Facebook and Google+ pages. Pineapple (“halakahiki,” or foreign hala,) long seen as Hawaiʻi’s signature fruit, was introduced to the Kingdom of Hawai‘i in 1813 by Don Francisco de Paula Marin, a Spanish adviser to King Kamehameha I. Credit for the commercial production of pineapples goes to the John Kidwell, an English Captain who started with planting 4-5 acres in Mānoa. Although sugar dominated the Hawaiian economy, there was also great demand at the time for fresh Hawaiian pineapples in San Francisco. After Kidwell’s initial planting, others soon realized the potential of growing pineapples in Hawaii and consequently, started their own pineapple plantations. Here is some brief background information on four of Hawai‘i’s larger pineapple producers, Dole, Libby, Del Monte and Maui Land & Pineapple. James Dole, an American industrialist, also famously called the Pineapple King, purchased 60 acres of land in the central plains of Oahu Island and started the Hawaiian Pineapple Company in 1901. In the year 1907, Dole started successful ad campaigns that introduced whole of America to canned pineapples from Hawaii. In 1911, at the direction of Dole, Henry Ginaca invented a machine that could automatically peel and core pineapples (instead of the usual hand cutting,) making canned pineapple much easier to produce. The demand for canned pineapples grew exponentially in the US and in 1922, a revolutionary period in the history of Hawaiian pineapple; Dole bought most of the island of Lāna‘i and established a vast 200,000-acre pineapple plantation to meet the growing demands. Lanai throughout the entire 20th century produced more than 75% of world’s total pineapple. More land on the island of Maui was purchased by Dole. Libby’s, one of the world’s leading producers of canned foods, was created in 1868 when Archibald McNeill and brothers Arthur and Charles Libby began selling beef packed in brine. In the early 1900s it established a pineapple canning subsidiary in Hawaiʻi and began to advertise its canned produce using the ‘Libby’s’ brand name. The Kāne‘ohe facility ultimately failed; some suggest it was because Libby built it on and destroyed the Kukuiokane Heiau in Luluku. In 1912 Libby, McNeill and Libby bought half of the stock of Hawaiian Cannery Co. By the 1930s, more that 12 million cases of pineapple were being produced in Hawaii every year; Libby accounted for 23 percent. Del Monte another major food producing and packaging company of America started its pineapple plantation with the purchase of the Hawaiian Preservation Company in 1917. The company progressed and increased its plantation areas during 1940s. In 1997, the company introduced its MD-2 variety, popularly known as Gold Extra Sweet pineapple, to the market. The variety, though produced in Costa Rica, was the result of extensive research done by the now dissolved Pineapple Research Institute, in Hawaii. In 2008, Del Monte stopped its pineapple plantation operations in Hawaii. The family of Dwight Baldwin, a missionary physician, created the evolving land and agricultural company. It first started as Haiku Fruit & Packing Company in 1903 and Keahua Ranch Company in 1909, then Baldwin Packers in 1912. In 1932, it was renamed Maui Pineapple Company, which later merged with Baldwin Packers in 1962. In 1969, Maui Land & Pineapple Company, Inc. (ML&P) was created and went public. In 2005, the company introduced its now famous “Maui Gold” variety, which is naturally sweet and has low acid content. Maui Gold pineapple is presently grown across 1,350 acres on the slopes of Haleakala. Maui Land & Pineapple Company is now a landholding company with approximately 22,000-acres on the island of Maui on which it operates the Kapalua Resort community. In addition, I have added other pineapple related images into a folder of like name in the Photos section of my Facebook page.